Thread number 500! What gig would you most like to attend, past or present? So here's your 500th thread question. You can attend any gig, past or recent, or even upcoming soon. It has to be a real show, by a real artist or band (ie, it has to have actually happened or be happening shortly). You may follow up your answer with the best gig you've ACTUALLY been to, if it's not the same one. I'll jump in eventually but I'd like to see what people submit first. Ok T3, well, for me it has to be sometime 88/89, Wembley, Prince - 'Lovesexy' Tour - The stage was at the centre of the huge hall and Prince entered in what appeared to be a pink cadillac from beneath the staging structure. What ensued was a mind blowing, energy filled trip through the 'Purple' hits, into Sign O The Times and Lovesexy itself. His musicianship was awe inducing, on guitar and piano.. And the sight of Sheila E. playing two bass drums, in high heels.... standing up.. woah! Thing is.. went to see him a couple of years later when he hit the 'Graffiti Bridge' era.. and oh dear, it all went very sadly downhill from there.. Mine personally would be Daft Punk at the O2 Wireless Festival last year. I was so dissapointed that I couldn't go, and I doubt that they'll be touring again for another couple of years now. Oh, and also pretty much any Muse concert. Must. See. Them. Live. Good thread T3... I was going to start a thread on same sort of thing but never got round to it. I'm actually going to see Doves at Royal Festival Hall in September and I simply can not wait. I have wanted to see Doves for years now and as soon as I found out about it I was itching to get tickets. It's their first gig in over 3 years. The reason being is their music brings back memories of very happy times which were then swiftly followed by a rough patch in my life which seemed to bring the whole world crashing down around me. Their music and lyrics just made sense when I was quite literally 'on top of the world', then a few months later at the bottom of the bottle. The music sums up the good times and brought me through the bad. I could go on but i think you get the picture! Otherwise, its hard to pin point previous gigs, I have been to so many over the past 8 years or so (i'm only 25). 3 which really stand out are Oasis at Finsbury Park (2003), Bloc Party at Somerset House (2005) and Prince at O2 (2007). Aaarrgghhh!! I've been trying to see Doves since 2004!! There are very few bands on my list of bands I haven't seen but must... they're one of 'em. Didn't hear about this gig until I read your post, and now of course there are no good tickets left. Let me know if you end up with any spares!! They're one of my favourite bands. ** sigh ** they've got a new record coming out so there should be a tour... I'll have to keep my eyes peeled for that. Probably metallica in their hay day on the puppets tour, i think that was with ozzy but i could be wrong but thatd definatly be the one for me. I wasn't there. I was only 11 years old at the time and had never heard of Dexter. I would have loved to have seen Nine Inch Nails with Atari Teenage Riot supporting in Brixton in 1999. The live album Atari Teenage Riot recorded that night is incredible. Trent Reznor was in the middle of his drug addiction and being generally mental on stage, smashing keyboards, jumping on Robin (the guitarist) and generally being crazy, contrasted with the beautiful moments of The Fragile they would have played like La Mer. Atari Teenage Riot that night were at breaking point. Hanin Elias was too ill to play, Alec Empire was on a cocktail of painkillers because the world tour had tired him out so much and Carl Crack had suffered a mental breakdown. That night is literally the sound of a band collapsing. Apparently some people were so angry at their set they tore up their ATR t shirts and threw them down in front of the band and spat on them. If you heard the album you would understand why. But yeah that gig would have been intense. 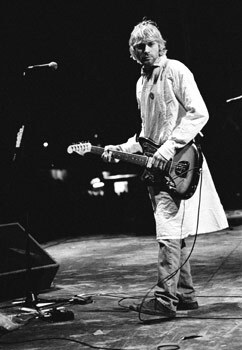 i would have loved to have seen..
Their last gig in the UK before Kurt Cobains untimely death. He was at the height of his drug addiction at this stage but this gig is often regarded as the greatest moment in their short time as a band.